Widespread and common in all forested habitats in western counties. 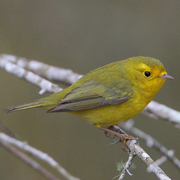 Less common in developed lowlands, but may successfully breed in remaining large habitat tracts. Uncommon breeder at moderate elevations in Kittitas County in moist forest along Cascade crest and in dry, open forest farther downslope, where often associated with riparian vegetation. 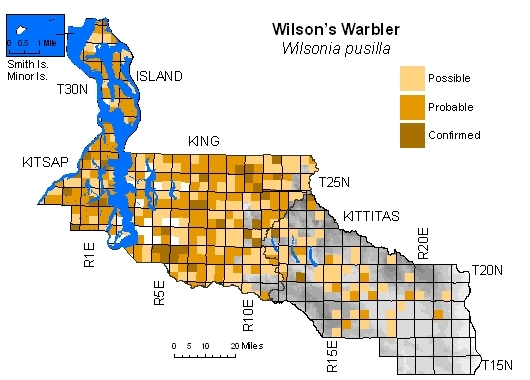 Records difficult to assess in urbanized King County, where good breeding habitat scarce; at least some may represent migrants, as species moves into June and begins dispersal by late July. Same caution applies to Kittitas County, although BBA records there earlier than 1 June have not been mapped.